In response to the demands of the Scottish Parliament (controlled by the majority Scottish Nationalist Party) the UK Government has agreed to hold a referendum in Scotland on the question of Scotland’s independence from the UK. This is due to be held in 2014. Already the ‘NO’ camp and the ‘YES’ camp have been set up fronted by prominent politicians and personalities to campaign for their case in the lead up to the vote in 2014. However, the debate around Scottish independence has been increasingly bothering me. It’s not that I have strong feelings either way about Scottish independence but it’s the way we’re going about it that bugs me. Whether we live in England, Scotland, Wales or Northern Ireland, we are all citizens of the United Kingdom, our nation state. As such we all elect our members of parliament from local constituencies throughout the UK and we all travel with UK passports when we venture beyond our island shores. We know that the UK is made up of four distinct nations, three of which have devolved government with their own parliament or assemblies composed of their own elected members, with the exception of England which kind of gets by without any of these legislatures. This road sign on the A1 road near Lamberton marks the border between England and Scotland. 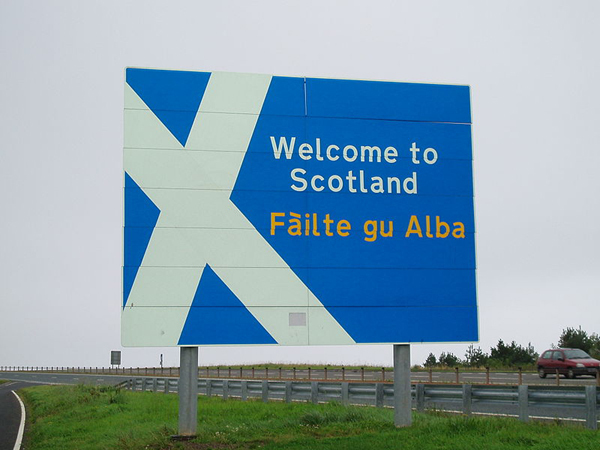 The sign’s design comes from the Flag of Scotland or the Saltire, a diagonal white cross on a blue background. The saltire stems from Parliament of Scotland having decreed in 1385 that Scottish soldiers shall wear a white Saint Andrew’s Cross on their person. This network of governance seems to me to be at least some kind of bond that unites us all as part of the UK. Now I could mention the Crown and the Royal family but really that’s an entirely separate issue of interest and, for me, great concern and I shall leave that for another time.The point that troubles me here is that while I can accept the people of one or more of our existing nations can decide that they would like to break away from the UK and become independent, it surely doesn’t stop there. Don’t we all have a right to have a say on the continuing status and perhaps existence of the UK? Don’t we all have a stake in the sanctity of our nation state? In my mind there should be a clear process to follow that respects the views of all UK citizens, or at least the majority of them. Simply speaking such a process would look something like this. Stage 1. The people of an existing nation and their elected representatives campaign for and get a majority in favour of independence.